These Baren require only a minimum amount of pressure to pull a beautiful print, a definite plus if you print large runs or if you are suffering from any sort of repetitive stress injury to the hand or arm. The Baren are backed with a matte black, rubberized ategawa (stiff backing piece). 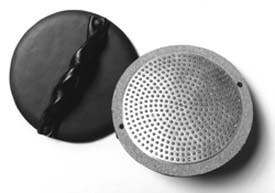 The ategawa holds a cork disk with a perforated metal plate containing the ball bearings. The thick, twisted leather handle is very comfortable to hold. A5901 and A5902 approximate a 16-ko Hon Baren or a coarse Murasaki Baren, and are designed for printing larger, flat color areas. A5903 and A5904 approximate an 8-ko Hon Baren or a medium Murasaki Baren, and are designed for printing fine lines and detailed areas. The cushioning in the A5902 and A5904 models is a light thin plastic disc that prevents the ball bearings from rattling while the Baren is being used. The difference in price between un-cushioned and cushioned Barens is about $10. While the Baren containing 612 ball bearings are intended for printing smaller areas and fine lines, we have discovered that they also print large areas very well and feel that they are the most versatile. The manufacturer now recommends using silicon-based oil instead of plant-based oil, like olive or camellia oil, to lubricate the ball bearings in the Baren. The reason is that plant-based oil can oxidize over time and become gummy, causing the ball bearings to stop moving. Because silicon is not good for plant fiber paper, do not use a silicon-oiled baren directly on the printing paper. Place a piece of backing paper like ategami or baking parchment between the baren and printing paper. Ideally, the manufacturer recommends laying a piece of thin acetate film or polyfilm smooth side down over the printing paper, spraying the textured side of the film lightly with the silicon oil, and then printing with the baren. A5904, 612 cushioned Ball Bearing Baren, are kept in stock. The rest are Special Order and must be paid for before we order them from Japan for you. Depending on the exchange rate, prices start at around $250 for Ball Bearing Baren with 378 ball bearings and $285 for ones with 612 ball bearings. Please call or email mail@imcclains.com for current prices. After placing your order, our price is guaranteed. Please allow 3 to 6 months for delivery. You will be charged for the Baren and shipping from us to you when you place the order. Once the order has been placed with the craftsman in Japan, there are no returns or refunds.